The first day of Spring (Feb 1st) has been important in Ireland from the Neolithic period. In Ireland the lighting of fires and candles invited the power of the sun in the period between the cold Winter months and Spring! Can you believe it folks….? We’re almost there and I am ready for the warmth of the sun and the buds of Spring to appear. The relics of St. Bridget and Columcille are said to be enclosed in Downpatrick in the same grave as our National St. Patrick. I loved this photography shared on the Friends of Saint Patrick’s website today of a group of students from John Brown University in Missouri placing a St. Bridget’s cross on the grave. The hanging of the St. Bridget cross on the front door is symbolically asking Gods protection on livestock and homes in many homes in rural Ireland. Those of you who have been on Shamrock and Peach tours are familiar with Dr. Tim Campbell and this quote he often shares around the grave side. Welcome Spring and and let the feasting of St. Bridget begin! What does St. Patrick’s day mean to you? Hearty beers and beef? How about shamrocks and green top hats? Or the river running through the city dyed bright green? Or just a fun night out with great friends? Well, the thing is that St. Patrick actually means a lot of things to different people, and I say…happy days! After all, if Irish culture can be celebrated like this once a year with folks having fun and enjoying themselves, then why not? – but what about ‘ol Saint Paddy himself? Most people don’t think about it, but St. Pat was quite a man. A trailblazer, a peacemaker, a kingmaker, a leader, a pastor, a father figure, a statesman, a writer and the stuff of legends, even in his own lifetime. He spent a lot of his time and founded his first church at Saul in County Down in the north of Ireland, and to this very spot I bring groups of guests each year on my tours to hear about Patrick’s inspiring story. – We all squeeze into this wonderful place that was founded in the 5th century and marvel at the history and the legend. – How could one man achieve so much and now be celebrated the world over? County Down and Saint Patrick’s country is so inspiring that we actually always spend a day in this region whilst on the Shamrock and Peach Irish Tour – and why not? apart from the eye-opening and inspiring history around every corner, it’s also a very beautiful place with the Mourne Mountains sweeping down to the sea – a place that has to be seen to be believed. So, take a moment this March 17th, and think of the man himself – then consider joining me on one of our tours this summer and I’ll introduce you to him personally! – We will walk in his footsteps, look out to sea and dream…let’s go! No visit to County Down would be complete without stopping by Balloo House to eat some delicious locally caught seafood. This most memorable Roast Cod with Strangford Lough Shellfish and Comber Potatoes was one of the best dishes I ate in Ireland last year with my tour groups. When you taste each perfectly prepared morsel it’s no surprise Chef Danny Miller won best Chef in Ireland back in 2010. My American guests are always enchanted to eat in the fine dining restaurant of Balloo House, a coaching house with a 400 year old history. Other prestigious endorsements also include the Michelin Guide, Georgina Campbell Guide, McKenna Guide and the AA Restaurant Guide. Many thanks to Chef Danny Miller and I cannot wait to return this summer. Our Legacy of St. Patrick..
Only weeks away until March 17 it’s appropriate to play tribute to Co. Down where our Irish saint is buried and Strangford Lough – Shellfish is the best. Wait…is that a burrito he’s holding? So here it is, the day has arrived when everyone is Irish, when everything appears green and when we all try on the Irish brogue (for a few words anyway) -even if the catch phrase involves ‘me lucky chaaaarms’! Oh yes, and despite being mistaken for Australian yesterday (ha!) I have to say I do love this time of year, as I’m sure oul’ Saint Patrick would if he were around to see it all…. 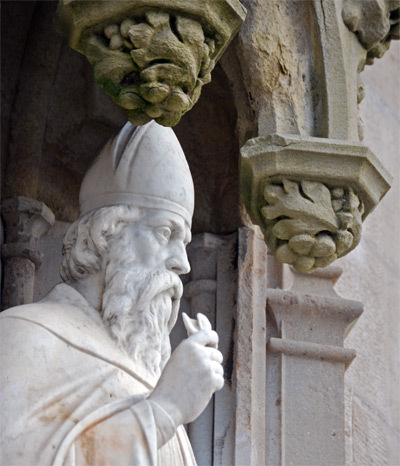 But wait a minute….who exactly was Saint Patrick anyway? Do ya know? Do ya care? Did he drink green beer and fall into the fountains in Savannah? Did he really pick up a shamrock for the King of Tara whilst wearing his ‘kiss me I’m Irish’ hat….or was he even Irish I ask??? Well, fear not because I’m going to clue you in on a big secret…. 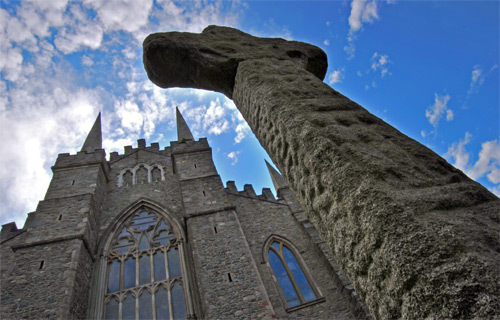 Yes, he lived in the 5th century and yes he came to Ireland to save souls, even though his was a Brit, so that’s why most monuments to Patrick in Ireland are Christian in nature, such as the early cross pictured below in Downpatrick in County Down, near the grave site of St. Patrick. You see, the story goes that Patrick as a young man, was captured by Irish pirates (red beard I’m guessing, not blackbeard!!) taken to Slemish mountain in Northern Ireland, but after a period of some years managed to escape and eventually get back home to what is now England. But what’s really cool about this is that many years later, as a prominent bishop and more mature Christian he felt a calling to go back to Ireland to spread the gospel to the very people who enslaved him! Yup, that means he was kind of a hero, and a clever one at that given he managed to persuade kings and peasants alike to turn to Christ from paganism. Quite a feat, and completely without the use of green beer, beads, silly hats, or corn beef for that matter! OK, I know I’m being kind of light hearted about this…but truthfully, the real Saint Patrick was a very noble individual who was obviously courageous, inventive and driven to what he did, so overall he was a cool guy methinks! Growing up in County Armagh in Northern Ireland, which is Saint Patrick’s country, I was always surrounded with reminders of Patrick from placenames to church names to street names and never thought much about him until later in life. In many ways I suppose you could say I took him for granted, oblivious to the great festivals thrown in his name around the world. 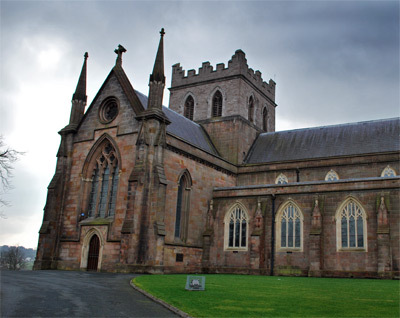 As an example, the church pictured here is Saint Patricks ancient cathedral in Armagh, which is sited on the spot of Patrick’s first church and is a thousand years old! Not bad. Now, I know that the festivals and parades are more about being Irish than they are about St. Patrick himself, but I thought it would be fun to clue you in….So, there you have it! Hope you enjoy the day, whatever you decide to do!